Since 1969, Coastal Moving & Storage has been committed to the moving and storage needs of families and businesses in Pensacola and the greater Gulf Coast area. Including relocation services for members of the Armed Services community, commercial facilities, and families, you can trust our Pensacola Moving Company for packing, loading, storing, and transporting professionals to care for your household goods or commercial property. As an agent for Mayflower Transit, we pride ourselves on being a full-service moving and storage company. Through Mayflower, we can assist you to move your family or your business down the street, out of the state, or out of the country. We understand that homeowners, deployed members of the Armed Forces, and commercial property owners have unique short and long term storage needs. At our secure facility, we can safely maintain your property for as long as you need us to. Are you moving your office or retail establishment? Hiring an outside expert is the safest, most efficient way to move your business. Our professional team members will help to pack, secure, and transport your equipment. We can temporarily store your goods between moves and even offer long term record storage services. For over 50 years, families and businesses around the Gulf Coast have trusted us with their most valued possessions and vital business equipment. We demonstrate our thanks for that trust by caring for the needs of each customer individually, and ensure that their goods are securely stored and transported. As a past winner of Mayflower’s Circle of Excellence Award and a two-time runner-up Agent of the Month, our Pensacola Moving Company takes pride in making sure our customers are happy. We’ve also earned numerous community awards as well as the Green Arrow Award from the Department of Defense, given to a government contractor who goes above and beyond when handling the long-term storage relocations of our armed service members and numerous community awards. 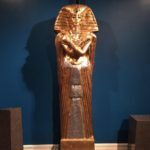 The King Tut Exhibit came to the History Museum of Mobile and Coastal Moving and Storage was there to help pack up the ancient treasures and help them move on to their next destination. If you are looking for a Pensacola Moving Company then please call 850-433-8308 or complete our online request form.